Like children, dogs are a huge responsibility and require plenty of care. The difference between the two is that dogs don’t grow up to be rebellious teens. Unfortunately, though, they sometimes end up in harmful situations that result in injury. If your dog got injured and had to be bandaged, here are some guidelines to remember that can help speed up the healing process. 1. When you bring your pet home from the vet, see to it that the bandage is still in place. Your dog might have tried to chew or scratch it off. Make sure that the bandage is secure and did not become loose. If it telescopes down a body part such as the abdomen or a leg, it could bunch up and abrade the area. Change the bandage when this happens. 2. 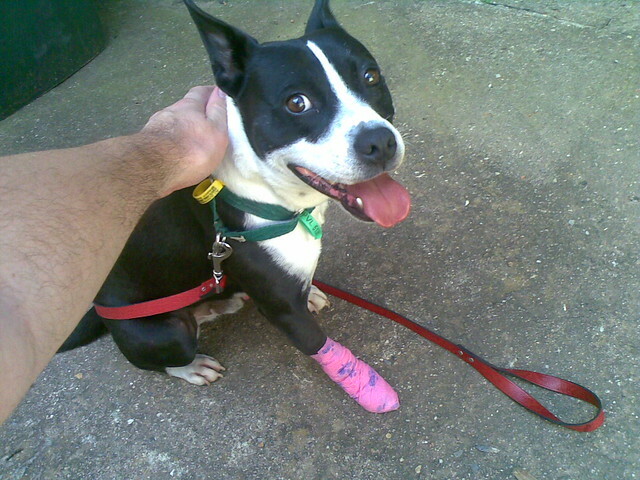 The bandage must always be clean and dry, so make sure that your pet stays indoors most of the time. If the bandage is on an area that could get wet when your dog pees or poops, use a plastic covering such as a trash bag or empty bread bag to protect it. Replace a dirty or wet bandage right away. Check the bandaged area twice a day to ensure that it is clean and dry. Also be alert for foul odors or discharge and call your vet immediately if there are any. 3. If the bandage is on a leg, see to it that it isn’t too tight. Observe your dog’s toes at least twice a day to spot any swelling, pain, or sweating. Look out for redness, skin chafing, swelling, or discharge before and after the bandage is applied. 4. The bandage might cause discomfort in your pet, so put him in an Elizabethan collar or cone to keep him from chewing on it. If you see your dog chewing or scratching the bandage excessively, ask your vet if there might be any problems.